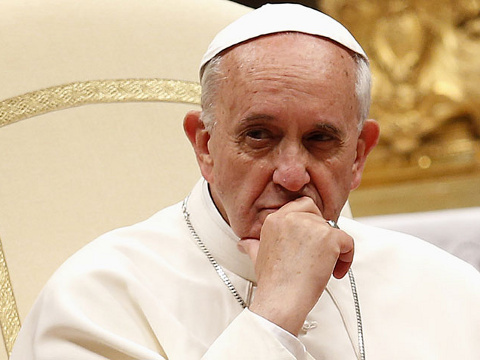 On the heels of Pope Francis’ groundbreaking remarks faulting the Roman Catholic Church for being overly focused on homosexuality and abortion, news has emerged that the pontiff ordered the excommunication of a priest who advocated for women’s rights and gay marriage. Melbourne-based news site The Age reports that Australian priest Greg Reynolds received a letter last week from Pope Francis, informing him that he had been excommunicated. The order means Reynolds is officially prohibited from participation in the sacraments and services of the Catholic Church. The letter, written in Latin, did not give a reason for the decision; however, the Archdiocese of Melbourne — the district which oversaw the three churches where Reynolds preached — told the Australian Associated Press that Reynolds had been shut out because he was publicizing his views that women should be ordained as priests. The Archdiocese also said Reynolds was removed for holding unauthorized communion ceremonies. The Age reports that the order to excommunicate Reynolds was made in response to a secret denunciation to the Congregation for the Doctrine of the Faith, an ecclesiastical body originally founded in the 16th century to defend the church from heresy. Reynolds had resigned as a priest from Western Port parish in 2011, at which time his priestly privileges were nullified, The Age reported last year. His 32 years of official priesthood behind him, Reynolds began operating an informal church in Melbourne in 2012. Called the Inclusive Catholics, the organization accepts homosexuality and allows women to help lead services. The Vatican could not be reached for comment.